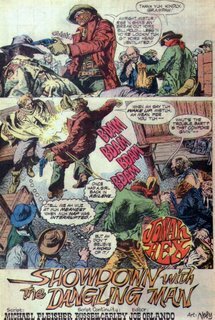 Matching Dragoons: Weird Western Tales #25 "Showdown with the Dangling Man"
Weird Western Tales #25 "Showdown with the Dangling Man"
Welcome to everyone finding your way here from the Jonah Hex Corral. I try to post reviews on Tuesdays (I'm late this week) with an occasional extra review on Saturday). Thanks for stopping in. 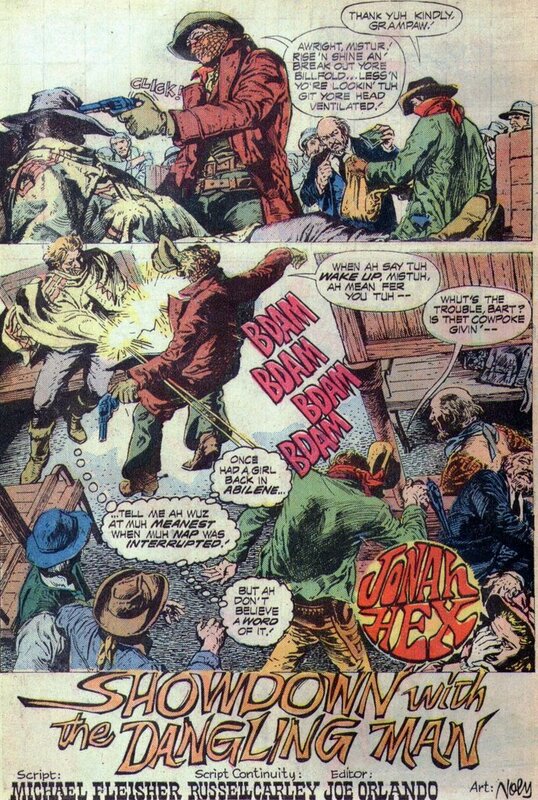 This week is somewhat ironic because Jonah is involved in a hanging and the current issue of Jonah Hex starts off with Jonah being IN a hanging. "Showdown with the Dangling Man"
A three page intro covers a train robbery that results in a boxcar of Army supplies being stolen. Meanwhile, two of the holdup men decide to liberate cash & valuables from the passengers. Sadly for them, Jonah Hex is on the train & makes short work of both of them. Hearing the shots, the two men looting rifles from the Army boxcar hightail it out of there but not before gunning down a conductor that had pulled a rifle on them. Jonah unloads his horse from the train and decides to give chase because "Men whut so rude to law-abidin' folks frequently got a price on their heads". Later the two train robbers come to Antelope Springs Way Station, a toll booth run by a slimy man named Silas Barfrey. Barfrey asks the robbers where the rifles are and they explain what happened at the train. They mention that a scar-faced man is pursuing the,. Barfrey tells them to hide in back of the saloon. Before Jonah can get to Antelope Springs Barfrey is confronted by an old man in a covered wagon heading west on the Oregon Trail. The man refuses to pay the $10 toll ($140 in 2006 dollars) . Barfrey tells the man that he can go around the toll-gate and the town, but he had better watch out for the pools of quicksand in the surrounding marshes. Jonah show up in town shortly after the old man leaves and is welcomed by Barfrey. Barfrey buys Jonah a drink & explains that he hasn't seen the men Jonah is after. Just then, a man runs in hollering about the old man getting stuck in the quicksand. Everyone heads out to see the action. The old man has managed to crawl from the marsh but everything he owns gets sucked into the wet sand. The man turns on Barfrey with a knife, blaming him for the loss of the wagon. Barfrey guns him down in cold blood saying all the while that his toll is perfectly legal. Jonah mentions that it may be legal, but it stinks. Jonah decides to ride to nearby Fort McPherson to report the train robbery and investigate if the toll gate is on the up and up. On his way, Jonah encounters a covered wagon trying to outrun a buffalo stampede. Jonah tries to aid the wagon but the wagon makes a sudden turn out of the path of the buffalo and almost runs Jonah over in the process. The wagon is driven by a widow and her two young sons. Her husband died of cholera just that morning. Jonah offers help burying her husband, but she refuses and says that after they are done they'll load up supplies in Antelope Springs and head on west. Jonah leaves them and continues on to the fort. At the fort, jonah reports the robbery & his suspicions about Barfrey to Col. Crandall. The Col. states that he will investigate. Jonah heads back to town but on the outskirts he sees the town gathered around a pool of quicksand. The widow's wagon is being sucked under along with both of her sons. Jonah manages to lasso the woman and drag her out but the entire town watches her sons as they sink beneath the sand. The woman blames Barfrey for her son's deaths and Jonah, fed up with everything, heads back to the fort to set things straight once and for all. When Jonah gets to the fort, he overhears the Col. talking to the two train robbers about how he gets a cut of the sale of the stolen rifles. Jonah breaks in and kills one of the robbers but not before a stray bullet kills the Col. Soldiers come in and the other robber blames the Cols death on Jonah. Jonah fights his way out of the fort & heads back to Antelope Springs. As he nears the town, he spots a piece of cloth stuck to a sign warning about a lime pit. Stopping to investigate Jonah finds the lime ravaged corpse of the widow. She has been murdered with an axe and tossed into the lime. As Jonah contemplates his next move, the surviving train robber shows up and pulls a rifle on Jonah. Jonah turns and throws a hatfull of lime into the robbers eyes and as the lime is dissolving the robbers face, Jonah guns him down. Jonah heads back into town to discover that the townsfolk are fed up with Barfrey and they are getting ready to hang him from his very own tollgate. Barfrey pleads with Jonah to take him in. He is a criminal so Jonah can get a reward for taking him to the fort. Jonah states that there is no reward on Barfrey's head so he ain't interested. As Jonah rides off, the townsfolk whip the horse Barfrey is on letting him hang from the tollgate. Then they set fire to the tollgate & Barfrey's corpse. Timeline - The Oregon Trail was in use from 1841 to 1869. Since Jonah is scarred here, it is after 1866 but I would place this story around 1868 or 69 since he is not wearing the black hat he had in 1867. Brandon, in research, discovered that Fort McPherson was located in Nebraska and since the Oregon Trail went through Nebraska & there is quicksand along the Platte River, everything seems to jive for this taking place in Nebraska. This is one of the more morbid stories I've seen. The rotting skeleton in the lime pit, the kids drowning in the quicksand, the faceful of lime, and then the burning corpse were all incredibly gruesome. 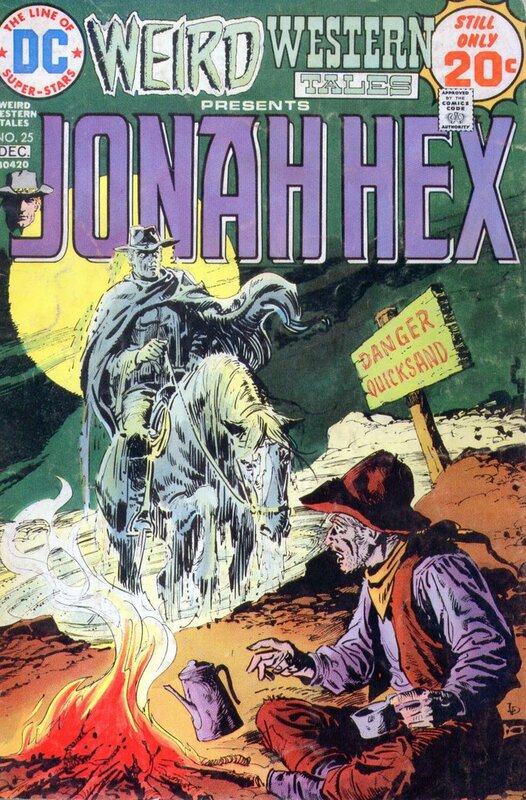 The cover was one of the best ones that Weird Western Tales ever had, perfectly capturing the weird part of the title by having Jonah and his horse rising from the quicksand. Panaglin's art is fantastic. I especially enjoy the layout of the title page with the circle with Jonah's name in it. The whole issue is very cinematic with the artwork flowing over the panels (like Dezuniga) and some panels not having any lines seperating them at all. Fleisher's writing was good with some nice comedy bits giving insight into Jonah's character and even his past (when he mentions that he hates stockade food). One of the best issues in the run. Oooh ooh, I HAVE this issue, and it's a dandy. If you like Jonah Hex, have you ever given Charlier and Giraud's (aka Moebius) Lieutenant Blueberry a try? It's French obviously, but there are translations, and Marvel's Epic did a nice collection quite a few years back. Not easy to come by, but really really good.